Outerlands found its home in San Francisco’s suburban-like Outer Sunset District. With an opposite microclimate from the sunny Mission District, a misty, salty fog cradles this district alongside the Pacific Ocean. As cool air whips off the off of the ocean, Outerlands provides a warm shelter within its dark wooden-paneled interior. Serving urban rustic food from local purveyors, this neighborhood restaurant attracts epicureans from all over the Bay Area. We started our meal with a salad of summer melon (cantaloupe) and padróns topped with feta, aleppo, sunflower, allium oil. 10% of pardón peppers produce a strong heat, while 90% of them are sweet and mild. There is no way of knowing if a pepper is spicy or mild beforehand, so this Russian roulette pepper-eating experience is full of surprises. Very few restaurants take as much of a hands on approach as Outerlands. Every night, while diners are being cranked out of the kitchen, a baker prepares the following day’s pain au levain. A hard, golden crust encases a soft, porous inside to make a perfect loaf of sourdough-like bread. This bread can only be found here due to the unique air, temperature, and humidity. You can order a few slices served with house cultured butter and a side of salt, or take a loaf home if you just can’t get enough. In addition to baking their own bread, they also smoke their own fish. We shared a smoked trout salad with grapefruit, frisée, fennel, sesame tuile, and housemade crème fraîche. 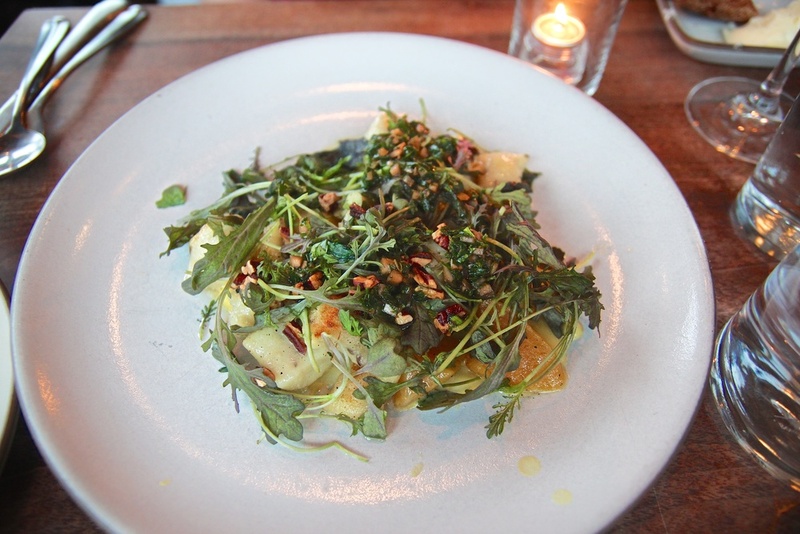 For another vegetarian shared plate we tried the farro appetizer. With notes of cashew, this normally crunchy grain dish was mixed in with fromage blanc, lemon, whey, and black garlic salt which gave it a risotto consistency. Pickled, beet-stained salsify laid on top of the creamy dish. We also shared the vegetarian main dish of golden beet and potato dumpling with caraway, red frill, and pecan bits. For dessert we shared a ganache block in a bath of honey, salted caramel, sherry vinegar, and topped with forbidden rice. At Outerlands the portions are small for the prices, but Outerlands' commitment to working with sustainable, local purveyors and their imaginative dishes make it worth the visit.